When Joseph Stomper first heard the prophecy, he swore a blood oath to protect Emily Morrow. Only she can destroy the Raven Mockers, the shape-shifting witches that feed on human souls. Now, seventeen years after her birth, Joseph’s mission is to prepare Emily for the battle ahead. But the more Joseph knows of Emily, the more he questions the strict laws of his people. After surviving a brutal assault that nearly claimed her life, Emily Morrow is looking forward to a trouble-free camping trip with her best friend, Kadie. But her post-grad getaway spirals out of control when Kadie is snatched by dark creatures nesting in the mountains of Cherokee, North Carolina, a place where nightmares dwell, hidden among the trees. Together, with Joseph Stomper, Emily must embrace her role in a centuries-old prophecy and learn to harness a dangerous new gift before she loses the ones she loves. But in a world where rules dictate action, there are consequences for those who follow their hearts. 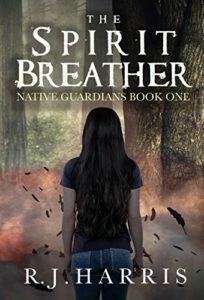 Can’t wait for the release of The Spirit Breather? Order Native Guardians Short Story – Phoenix Rising TODAY!